Read my note on Currency, India Macro, VoA, Debt and Money Market. About 8 lakh government employees is the US are now on an unpaid leave as republicans stick to their point to tweak Obamacare programme such that its impact on the spending budget is reduced. However, President Obama and democrats continues to remain firm to implement the aforesaid programme in full force. This has led to a gridlock in the house as members fail to pass the budget. This impasse cements view of more trouble going forward as US treasury run down of cash. US treasury will be left deserted by the third week of October after which Federal body won’t be able to honor its obligations. Immediately after 17th Oct (after which many believe treasury to go empty), treasury needs to retire Tbills coming up for maturity. Hence the risk of holding a Tbill maturing near the end of Oct Till first few days of Nov is perceived to be very high. This can be observed from the below table. 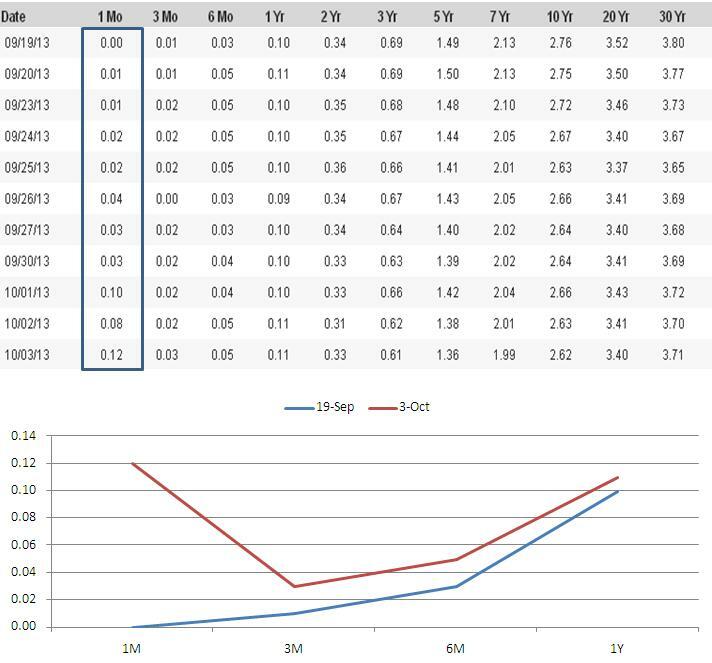 Yields on 1M paper has risen from ~0.00% to almost 0.12%. Asset managers and banks there have increased their duration by adding longer tenure bonds in order to avoid a delayed payment (technical default). Increased demand for long papers compelled yields to retreat from levels seen 10days before. As we move ahead towards the mid of this month short end of the curve may continue to move upward on the back of incremental risk. House faced similar obstacles in early august 2011 as well to raise the debt ceiling however the much needed then was done 3 days before the treasury starts defaulting. Dollar index and US equity market will continue to shrink till the time US resolves the issue or a big figure announces a firm commitment pertaining to the same. Lean season is present in almost all sectors barring healthcare and food Industry. Banks too have to go through lean season where lending slows down but deposit continues to grow. First quarter and some extended part thereon is the lean season for banks when corporates borrow less. This indeed improves cash balance with banks and hence banks reduces their CD issuances significantly post March end. Then arises a situation when demand for funds is low which subsequently leads to fall in short term rates. 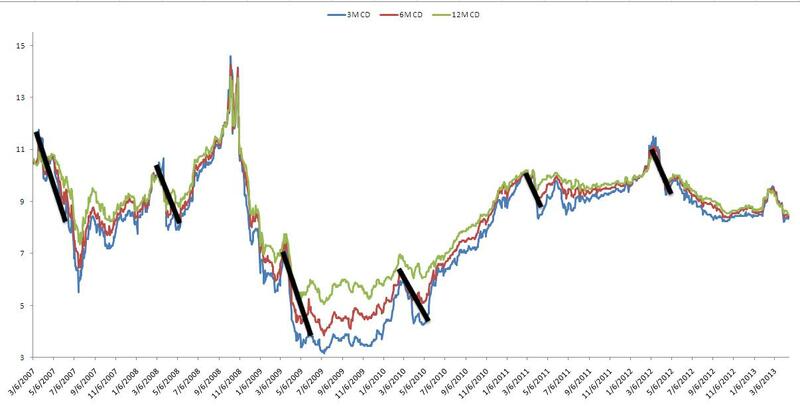 Below is the chart where one can understand the lean period effect highlighted by thick black bars. How do fund managers benefit from this seasonality? Fixed Income Fund Managers by February end starts switching their portfolio from G-sec to short term papers . 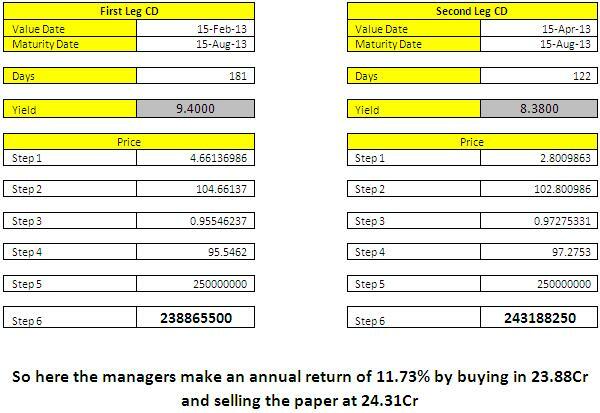 CD rates are high during Feb end and whole of March. They buy papers at high yields and sell the same in May-June at a lower yields benefiting from capital appreciation. No doubt there arises a risk of reinvestment for the fund managers but most of them start moving to G-sec/Long corporate papers as by April-May supply premium would have already been priced and rates should be on the verge of a fall on account of OMO expectation.